To freely disperse your Aurum's or Packages to your character(s), visit the Revelation Online Profile page and click the Inventory button. Select the name of the package you want to be applied, choose the server, then the desired character to fulfill the transfer process. To move your Aurums to your character(s), click the Balance tab to pull up the Balance window. 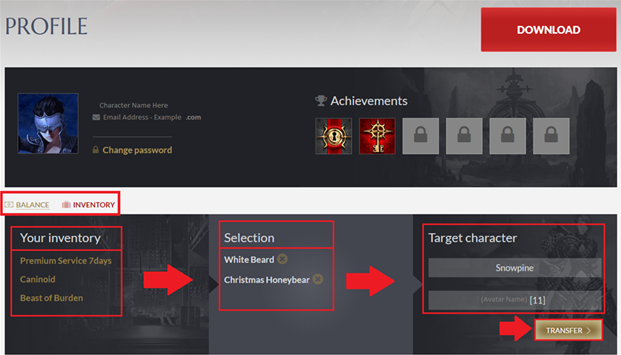 At this page, you can enter the desired Aurums you wish to have assigned, then select the server and Character, then click submit.